I donated two pieces for a raffle for her charity, Olive Tree Projects. 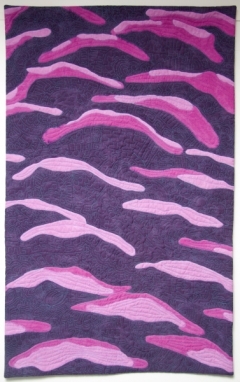 Together with another piece donated by Chelsea Treahy, our auction raised $995! This entry was posted in Uncategorized on January 23, 2010 by dahlia. I painted these with ColourVie pigments. All pigment quantities are per approx. 2 tbsp pigment base. Except as noted below, all paints were thinned with salt, and low-volume immersion painted in ziploc baggies. The dark inner leaf fabric was painted a little differently: I used a silicone kitchen brush to streak uncoloured pigment base onto the fabric, then streaked the paint on top of this. 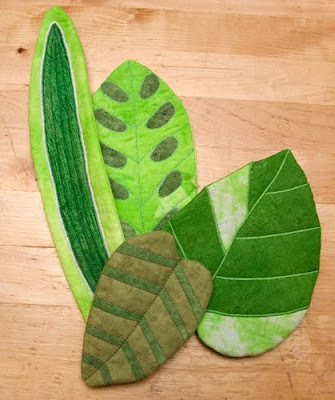 I satin stitched the dark inner leaf to the front of leaf. Sewed the front, back, and batting, and turned right side out. Straight stitched the veins on the dark inner leaf. I sewed the front, back, and batting of the leaf, holding the light highlight pieces in place (I should have fused them, to hold them more firmly), and turned right side out. Then satin stitched the edges of the highlights, and the other veins. 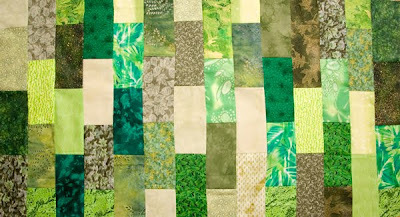 I fused the dark patches to the front of the leaf, before sewing the front, back and batting. Then after turning, I free motion quilted the center vein, and around the patches. This entry was posted in Uncategorized on January 15, 2010 by dahlia. This is what I used for the base of my leaf pillow. 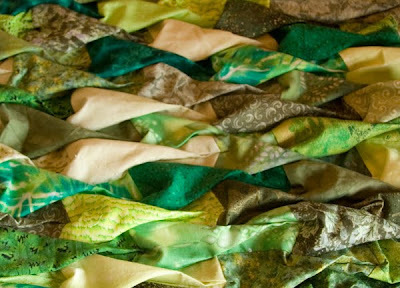 3″ x 6″ rectangles, all the interesting green fabrics in my stash. This entry was posted in Uncategorized on January 9, 2010 by dahlia.